Everyone, it seems, wonders what came first, the chicken or the egg. Well, what about time? Or to be precise, the way time is measured. I guess the day came first and then, once someone figured out division, the hours, minutes, and seconds followed. It would not be an accurately parallel equation to the chicken and egg question and truth be known the only worry most of us have about time is that sometimes we do not have enough of it and others time we have too much of it. Although time is finite it is my view that it does expand and contract depending on the circumstances; 60 seconds will always be 60 seconds but sometimes a minute will feel like and hour and other times it will pass as quickly as a blink of the eye. I’ve often said that the days drag but the years fly. If accomplishing everything we want in the time we’re given (and I’m not talking bucket list items but our chores or everyday tasks) what would we do with an extra hour if we had the time? Probably nothing. Just like you cannot separate a wave from the ocean, can you really add time to your day? You can speed things along and make better use of your time, sure, but you cannot make time. Haste, yes. Time? No. I recently watched a movie, ‘Out of Time’, released in 2003, starring Denzel Washington, Eva Mendes, and Sanaa Latham. This had been on my Netflix queue (for some time) and arrived, finally, and then I didn’t watch it until seven months had passed. I vaguely remember adding this to my queue, I had wanted to see it when it was first released, but probably didn’t have the time. I looked up the shipping date, April 1, 2014 because I was curious to know exactly how long this was sitting on my shelf. It made odd sense to me that it was October before I had the time to watch the movie as I don’t watch much entertainment during baseball season. But seven months? Before I found the time to watch a movie? I know we might not have time to have a colonoscopy but to be entertained? I like Denzel Washington; I like Eva Mendes, what took me so long? The basic premise of ‘Out of Time’ is good guy, wrong place, wrong decision, all adding up to a 105 minutes of wondering if Denzel will run out of time before he puts things right. I know the feeling. We really are all just victims of time. That desk phone that rings just as you are standing up to go to lunch, bringing a request that keeps you at your desk not being able to eat your ham sandwich until the sun has set. That missed train that leaves you on the platform allowing you to bump into that long lost friend and have an impromptu pub crawl that you somehow remember getting home from, but not sure who paid for the last round of potato skins. That e-mail that you haven’t read yet but you tell your boss you did and they say they haven’t so can you summarize it for them right now before they walk into a meeting. Or maybe, if not victim of time are we just the victims of how we use our time? Written by David Collard and directed by Carl Franklin, Denzel’s struggles with time are set against a more florid backdrop than my daily 24 hours paints for me. Yet, his success at beating the clock hinges on a great amount of luck and knowing how to use his time just like it does for the rest of us; the right time to open a door, the wrong time to tell the truth, the perfect time to cut and run. All very entertaining stuff, mind you, and well played out between the beautiful coastline and sky of Florida. But then I did it. For the first time in my life I fast-forwarded through to the end of the movie. Once I had the gist of where the story was headed and who was on whose side I hit the F2 button which resulted in a speeded up screen image and silencing the dialogue – have you ever done this? I remember social critics years ago bemoaning the loss of the American audiences’ attention span because we were living in the era of MTV and all that, but I have a pretty good attention span. I have patience. I wait for the ‘Downton Abbey’ series to be broadcast here on my home turf and do not download pirated episodes after they’re shown in England. Eleven years after it was first released, seven months after it was delivered to the comfort of my own home, 85 minutes into a 105-minute movie, I had to speed things up. And I was enjoying it but for the life of me I cannot figure out why I did this? I had nowhere to go, no one was ringing my phone, and dinner wasn’t burning on the stove. I just wanted to get to the end. Maybe I have become too accustomed to hour-long episodes of television, or maybe I was so intrigued that I couldn’t wait for the plot to unfold. Or maybe I was just out of time? The next day, Monday I put the Netflix envelope in the corner mailbox just before 7 a.m., I know this because that is what time my bus arrives. 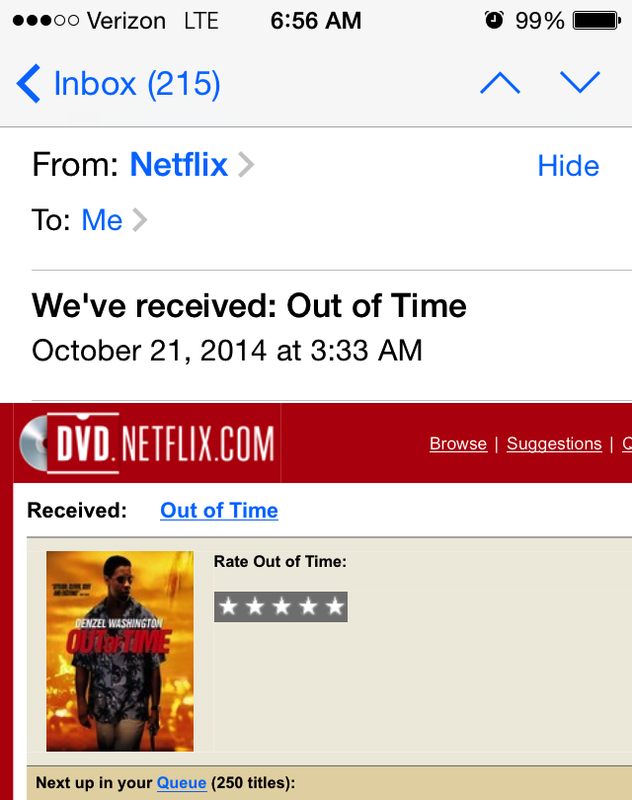 At 3:33 a.m. Tuesday morning, some twenty hours later, I was notified by e-mail that Netflix had received ‘Out of Time’. They certainly don’t waste any time.